"Both a pleasure to read and immensely useful�.Marcia�s wonderful book can become a powerful tool�helping us to know more about why it is we become ill."
"A very helpful resource for those who are ready and willing to take the lid off and communicate with their inner wisdom." "The Intuitive Healer provides not only the tools to assist you with that inner knowledge, but much more - the key to dealing with stress, the basic cause of all illness." "A wonderful book about accessing the inner knowledge that we all possess, but rarely take the time to consult�.I highly recommend The Intuitive Healer to both patients and physicians alike." "A generous, practical and accessible mix of exercises and suggestions from a broad and eclectic range of sources, to access the inner healer and complement more traditional medical approaches." Belleruth Naparstek, author of Your Sixth Sense: Unlocking the Power of Your Intuition and creator of the Health Journeys guided imagery audiotape series. 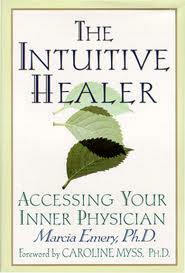 "A comprehensive step by step program to access the wisdom of your intuitive mind for greater healing and well being."